4 copies of Official Army forms. 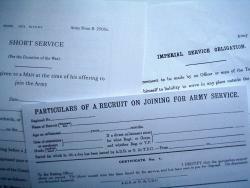 'Particulars of a Recruit on Joining for Army Service', 1918. 'Short Service (Duration of War) Attestation', 1914. and 2 different Territorial Force 'Imperial Service Obligation' for Foreign Service.